With its exceptionally long stipe this woodland fungus is a very stately mushroom indeed, and it is often seen in large numbers, either in arcs or even complete fairy rings, sometimes many metres in diameter. The Trooping Funnel is one of the few large mushrooms that can survive mild frosts, and so specimens are sometimes seen standing right through to late December. The central umbo and smooth felt-like surface of this large, long-stemmed mushroom are distinguishing features. Over the years this common but nevertheless imposing mushroom has gathered quite a collection of common names, among which are Giant Funnel (an unfortunate choice because this name is now almost universally accepted as applying to an even larger funnel-shaped mushroom Leucopaxillus giganteus), Monk's Head, and (particularly in Scotland) the Rickstone Funnel-cap. 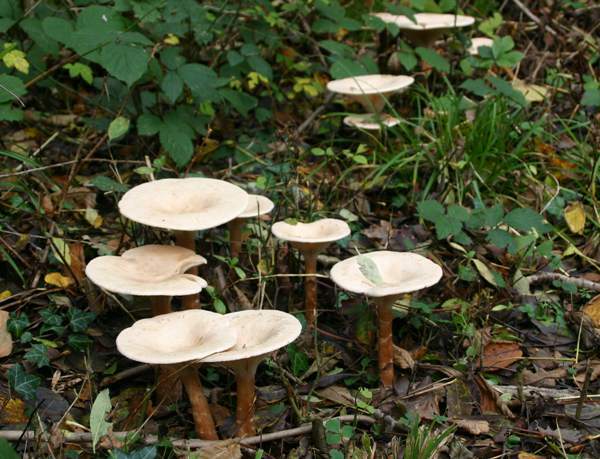 Clitocybe geotropa is very common throughout Britain and Ireland and is also found across mainland Europe. This species also occurs in North America. When the pioneering French mycologist Jean Baptiste Francois Pierre Bulliard described this species in 1792, he gave it the name Agaricus geotropus. (Most gilled fungi were initially placed in a giant Agaricus genus, now redistributed to many other genera.) In 1872 another French mycologist Lucien Quélet transferred this distinctive mushroom to the genus Clitocybe, renaming it Clitocybe geotropa. Synonyms of Clitocybe geotropa include Agaricus geotropus Bull., and Agaricus pileolarius Sowerby. 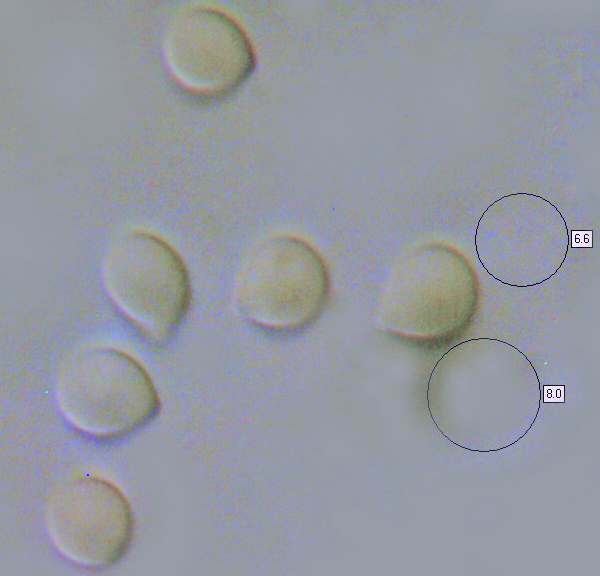 Some authorities now accept this species as a member (and indeed the type species) of a new genus proposed in 2003 by Finish mycologist Harri Harmaja, and they record it as Infundibulicybe geotropa. 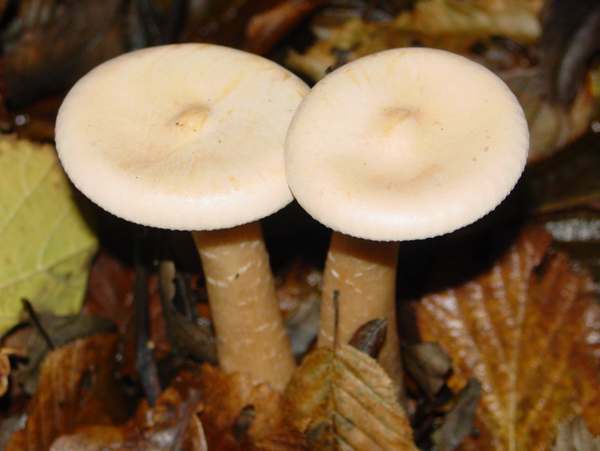 The generic name Clitocybe (usually pronounced 'klite-oss-a-bee') means 'sloping head', while the specific epithet geotropa is derived from two ancient Greek words meaning 'earth', and 'turn, direction or way'; geotropa is therefiore a reference to the fact that the cap margin is turned downwards - towards the earth - although in aged specimens the margin has a tendency to flatten out. 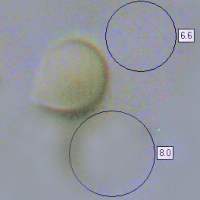 The creamy-buff caps can grow up to 20cm in diameter, with 10 to 15cm more typical. Smooth, matt and convex at first but later flat or shallowly funnel-shaped, the cap retains a fairly broad central umbo. 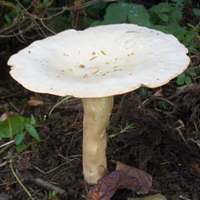 The thick cap flesh is white and very firm, and when young this is a good edible mushroom (but the tough, fibrous stem should be discarded). The broad, crowded gill are deeply decurrent and concolorous with the cap. In young specimens the stem is slightly paler than the cap, but as the fruit body matures it becomes much the same yellowish-buff colour all over. 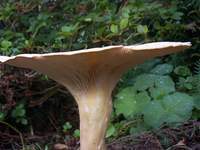 The fibrous stem is smooth, without a ring, thickening towards the base. Subglobose, smooth, 7.5-9.5 x 6-7μm. Faint smell of bitter almonds; taste not distinctive. In trooping groups or rings in deciduous woodland, especially clearings; also under broadleaf trees in parkland and sometimes on roadside verges beside hedges or forests. August to early December in Britain and Ireland but a month or more later in southern Europe; occasionally evident right through to the start of the New Year. Clitocybe gibba, the Common Funnel, is smaller and usually has a wavy cap edge; its flesh is much softer and the stem is often hollow. Entoloma sinuatum has a shorter stem and sinuous gills that do not run down the stem; its spore print is pink rather than white. This is a poisonous fungus, so it is important to check all features in order to avoid confusing it with the edible Trooping Funnel. 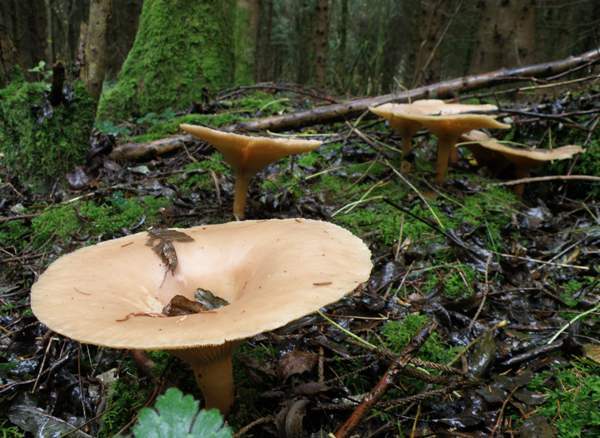 If in doubt, do not gather any wild fungi to eat. Clitocybe geotropa is a very acceptable edible mushroom, although not in the top rank. When young and fresh it can be used either fried with onions or in risottos, soups and many other mushroom dishes. The stems are rather tough and so many people discard them and eat just the caps.